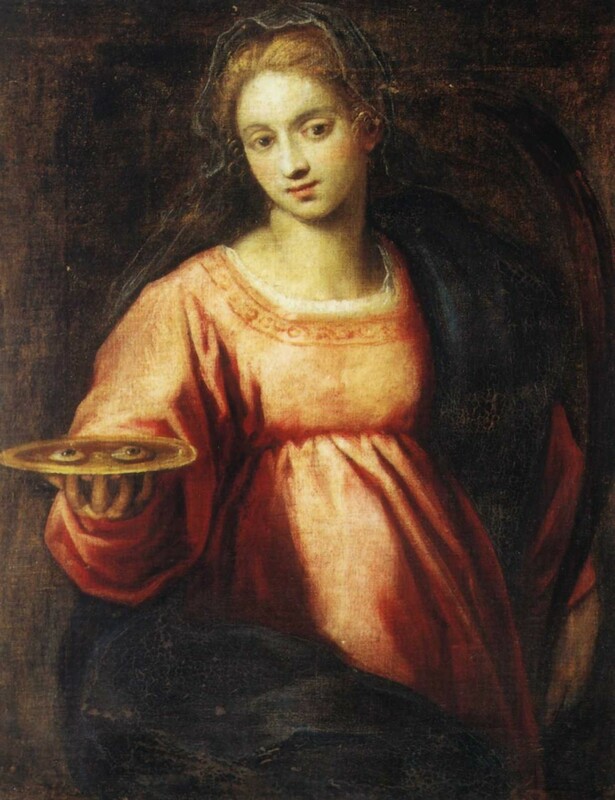 Santa Lucia (Saint Lucy) is one of the most beloved saints in Christian devotion. She was born into a wealthy noble family in Syracuse, Sicily, around the year 283. The father (who was perhaps called Lucio) died when Lucy was very young. As a young woman Lucy was promised in marriage to a pagan. Christians, like Lucy, were at this time still very much a minority in Syracuse. However, on a pilgrimage to visit the tomb of St Agatha, Lucy had a vision of the saint which was to change the direction of her life. Agatha spoke to Lucy telling her she would cure her mother’s illness (internal bleeding), which she did. After this experience Lucy knew she must dedicate her life to Christ. She made a vow to remain a virgin to better serve her purpose. On her return to Syracuse, Lucy told her mother of her decision to dedicate her life to Christ, as well as to give all her worldly possessions to the needy. Her mother was at first, (perhaps naturally) sceptical. But eventually it seems she was won over by Lucy’s faith and determination. Over the following years Lucy’s fame in dedicating her life to the poor spread throughout Syracuse and further afield. The young man who wished to marry her, seeing Lucy give all her money and possessions to the poor, and having been refused, decided to denounce her to the town prefect as a Christian. For some time the Roman Empire had felt threatened by this growing Christian “cult” and wanted a display of Rome’s continuing might and power. Lucy was a well-known figure in the community. If she could be forced to renounce her faith other Catholics might follow her. This was the thinking of those who brought her to trial. So, Lucy was brought to court, where she was accused of being dissolute and possibly of unsound mind too (this was still largely a pagan society where a person’s wealth and possessions were how they gained status in life). It was to be a public trial, so that the humiliation of Lucy could discredit her religion and serve as a warning to other Christians. However, the Romans underestimated Lucy’s faith and strength. The story of Lucy’s trial is recounted in “The Golden Legend” (a classic early 13th century work of Christian literature). From this work we hear how Lucy called herself “the handmaid of God” and see how her profound answers to the judge quickly won her support and have become part of her myth. At one point the judge Paschasius mocked Lucy for her virginity and said that she would be taken to a brothel, and here she would “lose her chastity” and then “the Holy Ghost shall depart from thee”. Lucy replied that her strength in God meant that 10,000 men would not be able to move her. When the judge put Lucy’s boast to the test this was found to be true – the men could not move her. The judge subsequently ordered for Lucy to be burned and a great fire was built. Lucy again stayed calm and asked for protection from the Lord, calling herself “a temple of God”. The fire was lit, but the flames did not touch her. Lucy told that crowd that persecution of Christians would not last much longer. Hearing her speak so eloquently the prefect was at his wit’s end and called out for anyone that could kill Lucy. Finally someone (probably a soldier) drew a sword and cut Lucy’s throat, which finally killed her. The date of Lucy’s death was recorded as 13 December 304. Very soon after her death the body of Lucy became a symbol of veneration. Her body in the catacombs in Syracuse received many worshippers. By the beginning of the sixth century Lucy’s fame was such that a basilica was built for her in Syracuse. Around this time, too, her name was sufficiently well-known to feature in the special prayers of Pope Gregory. When Syracuse was invaded Lucy’s body was taken to Abruzzo, Italy. 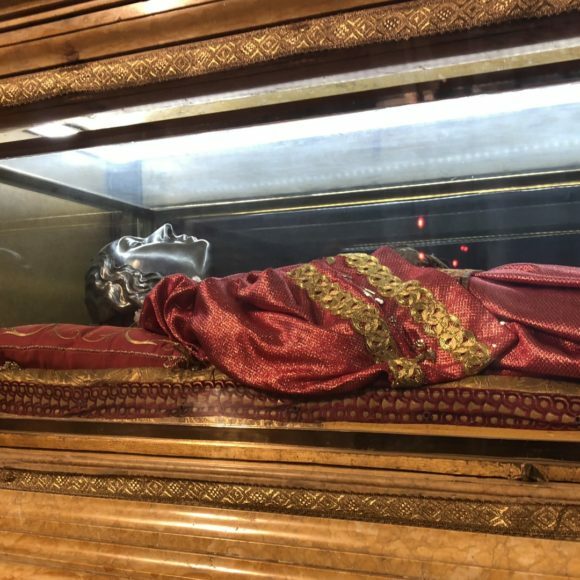 In the eighth century her body was moved once again, from Abruzzo to Constantinople, for safety during the Saracens invasion. 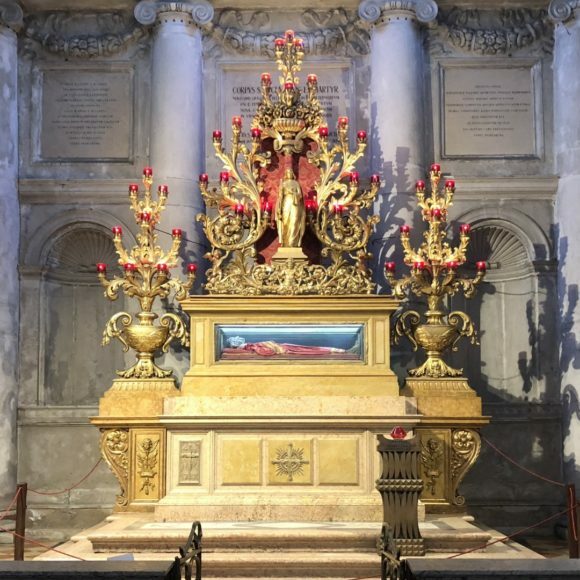 In 1204, during the Fourth Crusade, her relics were taken by the doge Enrico Dandolo and returned to Italy. 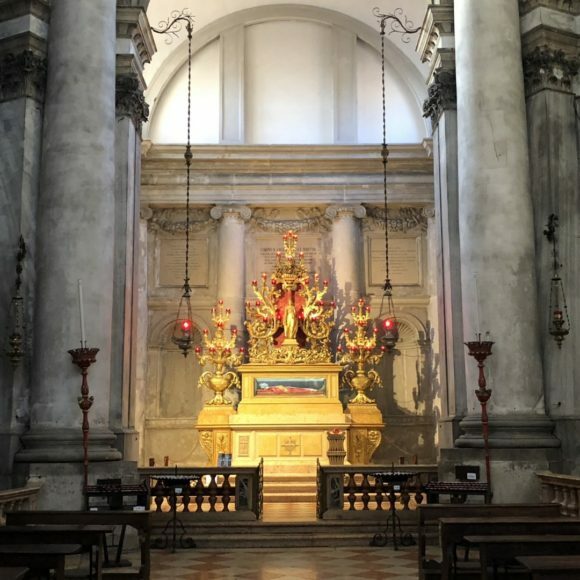 Eventually they were placed in San Giorgio Maggiore in Venice. However, the island was too small for the great number of worshippers her relics attracted. In 1279, on St Lucy’s Day, a tragedy occurred when several pilgrims drowned after their boat capsized. 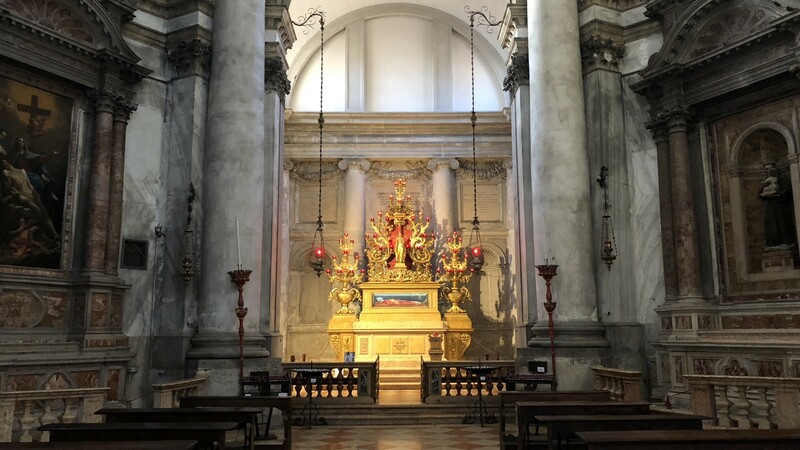 After this the Senate decided that the relics should be moved to the centre of Venice. 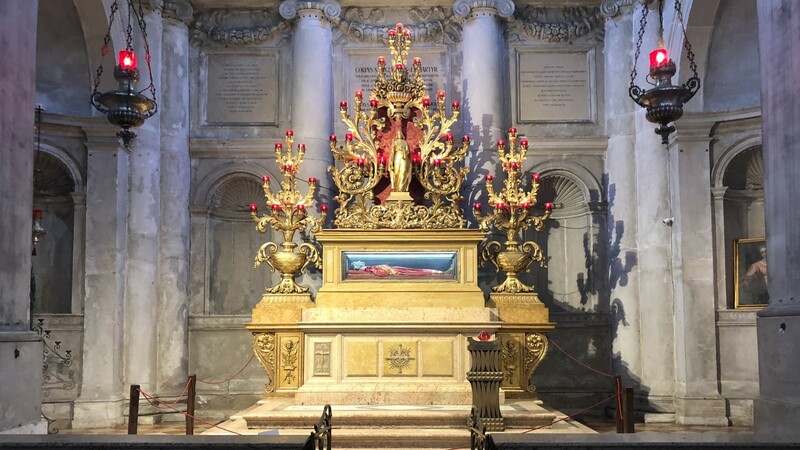 So, Lucy’s remains were moved again – and eventually laid to rest in a church built especially for her in Cannaregio. The iconic image of Lucy, which many great artists have captured, is often with her holding a golden plate offering a pair of eyes. This derives from a story that her suitor complimented her beautiful eyes. Hearing this Lucy plucked out her eyes and offered them to him – not wanting anything to come between her and her devotion to her religion. This addition to the Lucy story, however, was not included until the fifteenth century. The idea probably came from her name Lucy, which derives from ‘lux’ which is the Latin for “light”. In Sanctuary of Lucia, close to Lucy’s Chapel, you can see a famous version of this iconic image by Palma il Giovane. 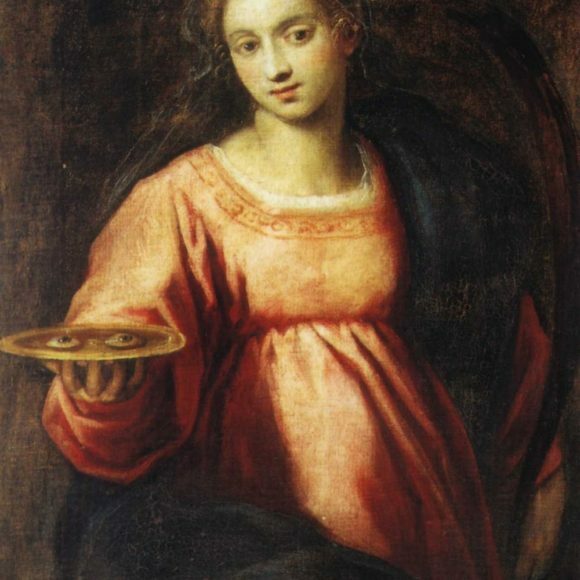 Because of her iconic association with eyes, Saint Lucy has become the patron saint of the blind. 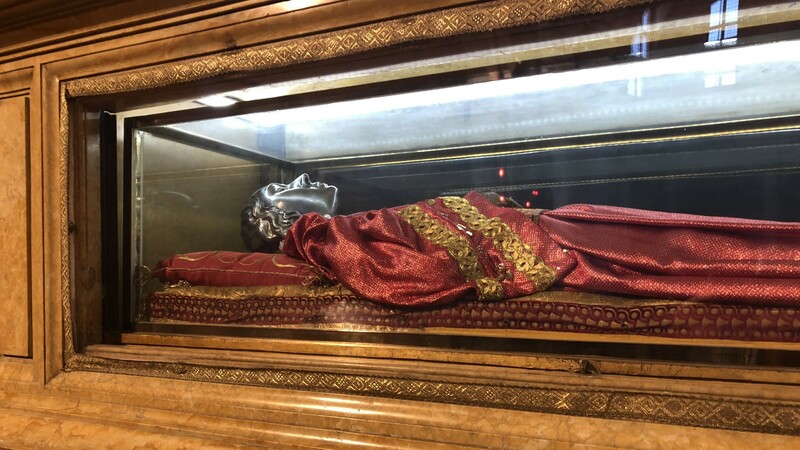 She is also considered as a protector of the eyes, and many people with eye diseases pray to her (Dante said to have prayed to her to save his sight, and when she did so he included her as a character in his great ‘Divine Comedy’). Lucy is also the patron saint of opticians. Amongst other groups she is also the patron saint of electricians, glaziers, peasants and writers.